Exosomes are lipid bilayer extracellular vesicles (EVs) of 50-150nm in size, which contain nucleic acids (mRNA, ncRNAs and DNA), proteins and lipids. They are secreted by all cells and circulate in all body fluids. 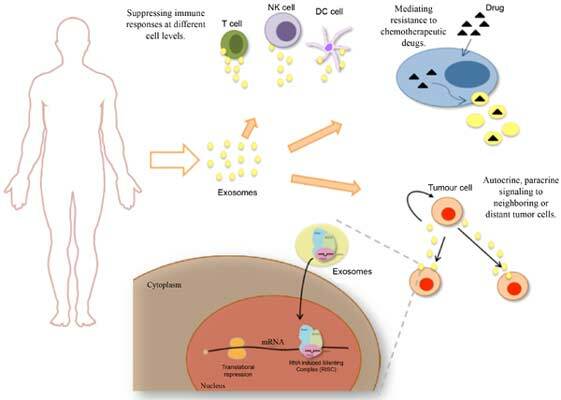 Exosomes are key mediators of several processes in cancer that mediate tumor progression and metastasis. These nano-vesicles, when secreted from cancer cells, are enriched in non-coding RNAs (e.g. microRNAs) complexed with the RNA-Induced Silencing Complex (RISC), that mediate an efficient and rapid silencing of mRNAs at the recipient cell, reprogramming their transcriptome. MicroRNAs in circulation encapsulated in exosomes are protected from degradation by a lipid bilayer and might serve as potential non-invasive diagnostic and screening tools to detect early stage cancer, to facilitate treatment options and possible help in curative surgical therapy decisions. Additionally, engineered exosomes can be used as therapy vehicles for targeted delivery of RNAi molecules, escaping the immune system detection. Exosomes, Extracellular vesicles, microRNAs, microRNA biogenesis, Non-coding RNAs. Institute of Molecular Pathology and Immunology of the University of Porto (IPATIMUP), Rua Dr Roberto Frias, s/n, 4200-465 Porto, Portugal.